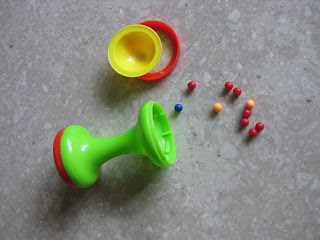 Yesterday, Bubbles was shaking this rattle when one of its ends burst open, spraying out little balls! Thankfully my mum was around to witness the incident so she quickly removed from Bubbles the rattle, broken parts and the innards that fell out. We shudder to think what could have happened if no one was around to watch Bubbles, and if she had cut herself on the sharp edges or swallowed the hard plastic balls. In fact, the balls just missed shooting into her mouth. She's at the stage where she likes to feel things with her lips and tongue, and would most certainly have popped any of the rattle parts in her mouth if left to her own devices. Sadly, this rattle came as a set with other interesting sound making objects. I'm not going to let her play with any of them from now on, and would be throwing away the whole set (which is one of her 1st-month celebration gifts). It is 'Made in China" and while practically everything is these days, I'll be more careful about selecting toys that are well-made and baby safe! Woah. That was a really close call. Thankfully your mum was around. I know! Thank God mum was there indeed!